Healthy and delicious ... cooked whole grain brown rice, sautéed onion, garlic and spices, black beans, corn, and cheddar cheese inside a flour tortilla. Prepare rice according to package directions. While rice is cooking, heat oil over medium heat. Add onion, garlic, chili powder, and cumin. Sauté 3 to 5 minutes until onion is tender. Add cooked rice, beans and corn; cook stirring 2 to 3 minutes or until mixture is thoroughly heated. Remove from heat. 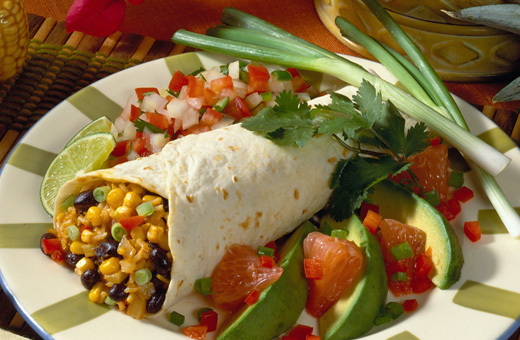 Spread ½ cup rice, beans and corn mixture in the middle of each tortilla. Top each with 2 tablespoons shredded cheese, 1 tablespoon green onion and sour cream. Roll up and top each with salsa.